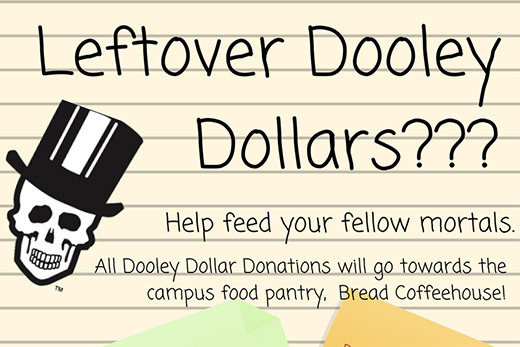 Emory College students can again use their leftover Dooley Dollars this spring to help others in need. The Dooley Dollars Donation project allows to students to spend the unused money from their meal plans to buy a range of products for the campus food pantry, located at the Bread Coffeehouse. The students can make donations at Peet’s Coffee, Cox Hall, SAAC at Clairmont and White Hall by telling the cashier how much food they want to buy. The purchased food will be ordered by Emory Dining, which will deliver the items to Bread Coffeehouse. The last day to make a donation is May 11. The program was founded by two Oxford Scholars, Caroline Abbott and Crissy Hendrickson, on the Oxford campus. The pair brought the initiative to the Atlanta campus last year. Both Abbott and Hendrickson are graduating this year, but plans are underway to make the program permanent for coming years.